It’s close to the beach, close to a major shopping area, it’s clean and it’s a green oasis. That best describes Mihama Dai-san Park, tucked away close to Mihama Carnival Park near Camps Foster and Lester. Read More! 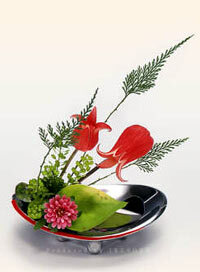 The art of flower arranging gets plenty of attention this weekend as the 51st Ikebana Flower Exhibition and 50th Anniversary Celebration demonstrates the art this weekend. The three-day event hosted by Ikebana International Okinawa Chapter #10 takes place at Okinawa Mitsukoshi Department Store on Kokusai Street in downtown Naha City, beginning on Saturday. Read More! Aimee Fujishin is from Rosemead, California, and has lived on Okinawa one year. In this week’s raffle she won two dinner tickets to restaurant Sam’s-by-the Sea. Read More! Since the 1950’s, one thing has remained constant: the USO continues to provide services enjoyed by service men and women as well as the local community. Planning and preparing this years USO Service Salute Gala a number of questions about the event itself sparked an interest to seek historical information and the impact of the USO. Read More!